A raised area on a lower lip of a two-lipped corolla that obscures or blocks the mouth. In grasses (Poaceae), the inner of the two bracts enclosing the floret; in composites (Asteraceae), the chaff (bracts) of the disk florets of the receptacle. With parts radiating from a common point, like fingers of a hand. A leaf comprised of separate leaflets that radiate from a common point, like parts of a fan. With projections that radiate from a common point, as fingers in a hand. Fiddle-shaped (constricted in the middle). A branched, indeterminate flower cluster (inflorescence) with individual flowers on stalks (pedicels). 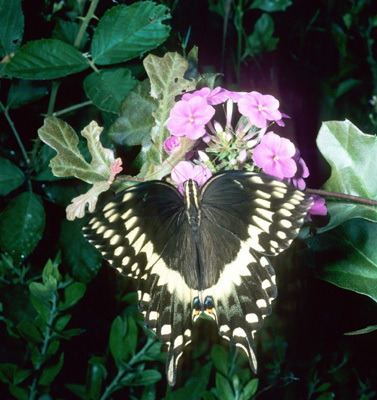 Eastern Tiger Swallowtail, photo ©Herman Giethoorn . 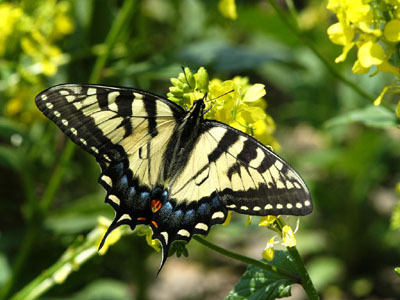 Shaped like a pea-flower, with an upright banner petal, two lateral wing petals, and two lower petals fused into a keel. Palmedes Swallowtail, photo ©Sturgis McKeever, Georgia Southern University, Bugwood.org. 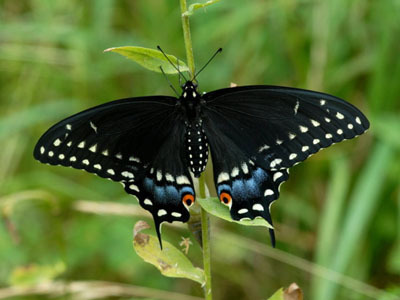 Black Swallowtail, photo ©Herman Giethoorn . 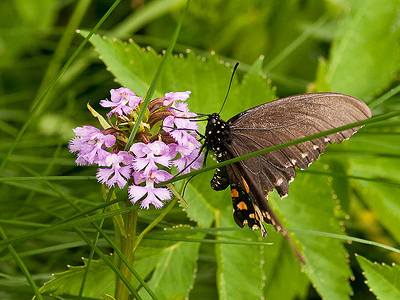 Spicebush Swallowtail, photo ©Jim Fowler . A short, rounded, blunt projection. Covered with small, soft projections. A series of scales, hairs or bristles surrounding the tip of the achene in Asteraceae. With veins that run side-by-side at the same angle and do not converge, often arranged parallel to the midvein of the leaf blade. A compound leaf in which all the leaflets are paired, with no terminal leaflet (compare with imparapinnate). Living on, and deriving nutrients from, another organism (usually to the disadvantage of the host). 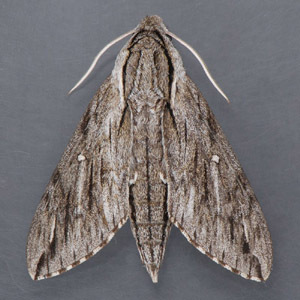 Plebian Sphinx Moth, photo ©Mark J. Dreiling, North American Moth Photographers Group. The stalk of a single flower in an inflorescence. A stalk that supports an inflorescence composed of 1 or more flowers. Round and attached at the middle, like a mushroom to its stalk. With a tuft of hairs at the top. A large, thick-walled leathery berry as in a pumpkin, derived from an inferior ovary. Surviving the winter or dormant season. A plant that lives more than two years. With both male and female organs on the same flower. The bases of a leaf or two opposite leaves join around a stem so that the stem appears to pass through the leaf or leaf pair. The whorls of sepals (calyx) and/or petals (corolla) that enclose the reproductive parts of an angiosperm flower. The mature ovary wall of a fruit. A membrane sac enclosing the flower and later, the fruit (achene) of Carex species. With a superior ovary that has a hypanthium. A leaf or organ that remains attached to the plant throughout the year or after performing its normal function; evergreen. Covered with 1 or more scales, as in the winter buds of woody plants. One of the hightly modified leaves of a flower, usually pigmented and attracting pollinators. An organ such as a sepal that resembles a typical flower petal in color and shape. With a petiole (leaf stalk). Stalk of a leaf that bears the blade. Stalk of a leaflet in a compound leaf. 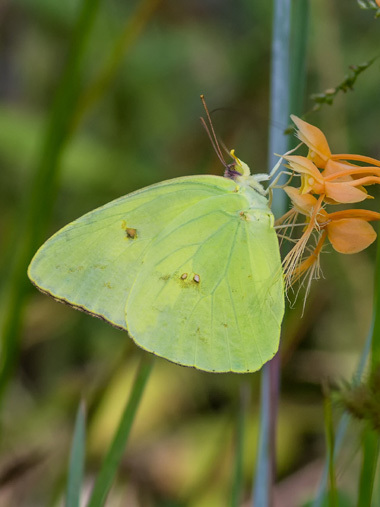 Cloudless Sulphur Butterfly, photo ©Jim Fowler . A series of chemical reactions by which plants use light energy to convert carbon dioxide into carbohydrates. One of the many leaf-like bracts that surround the base of the capitulum in Asteraceae; synonym "involucral bract". With blade-bearing leaves arising only from the base of the plant (center of parent shoot). Curve-lined Owlet Moth, photo ©Mike Boone, North American Moth Photographers Group. 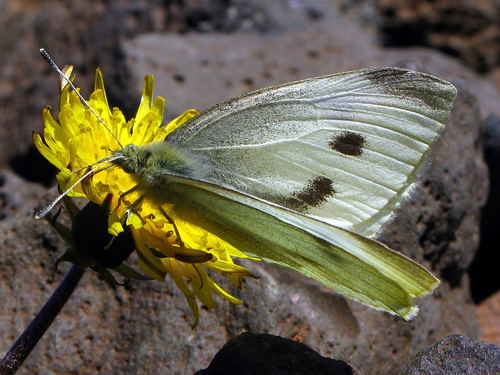 Cabbage White Butterfly, photo ©Alan Cressler. With sparse, thin, spreading hairs. Leaflet of a fern frond. Once-divided, as with ferns with fronds divided into pinnae. A leaf comprised of leaflets that are arranged along both sides of an elongate axis, as in a feather. 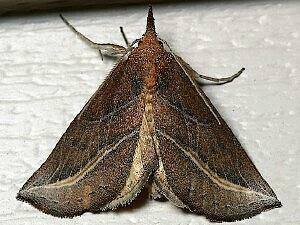 With projections on each side of an axis, as in a leaf with lobed margins on both sides of the midvein. Not quite divided all the way to a midrib of a leaf, i.e. without separate leaflets. The ovule-bearing parts of a single flower, composed of one or more carpels that are usually differentiated into an ovary, style, and stigma. Internal tissue of a stem or root. The part of the ovary to which the ovules or seeds are attached; placentation describes the arrangement of the placenta in the ovary. How the ovules in an ovary are attached to it. Flat; the orientation of a flat surface. In cross-section, with one flat surface and one convex surface. A tiny plant that is produced vegetatively and is identical to the parent plant. Indented in a long line; usually describing a leaf. 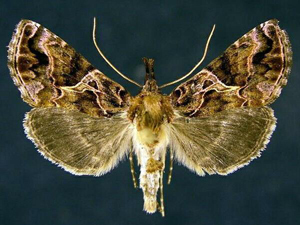 Looper Moth, photo ©John Davis, North American Moth Photographers Group. A dry, dehiscent fruit enclosing a hollow space with one or more seeds; a legume is a type of pod. 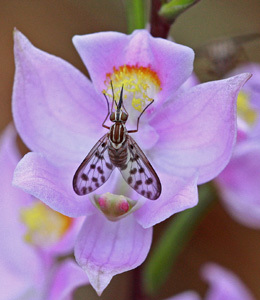 Bee Fly, photo ©Mary Keim. 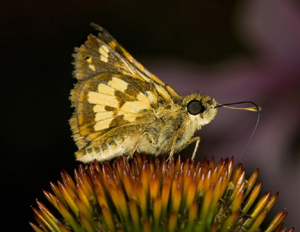 Long Dash Skipper, photo ©David Cappaert, Michigan State University, Bugwood.org. 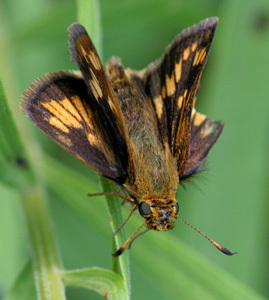 Peck's Skipper, photo ©David Cappaert, Bugwood.org. The sperm-bearing microgametophyte of seed plants. A pair of pollinia plus the structures holding them together (in orchids and some other plants). The process by which pollen is transferred to a receptive stigma. An agent such as an insect or animal that transfers pollen between plants. An aggregation of pollen grains in orchids and some other plants (plural: pollinia). 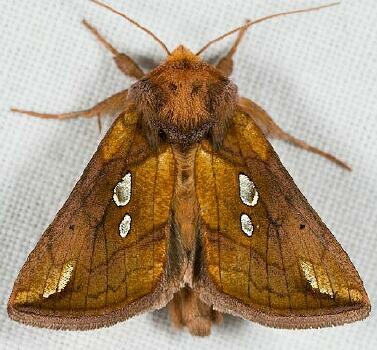 Disjunct Looper Moth, photo ©Jim Vargo, North American Moth Photographers Group. With both unisexual and bisexual flowers on the same plant. A fleshy fruit derived from a compound, inferior ovary, with a papery or bony inner ovary wall (endocarp) that usually encloses several seeds, as in an apple. Habitat dominated by warm-season, perennial grasses. 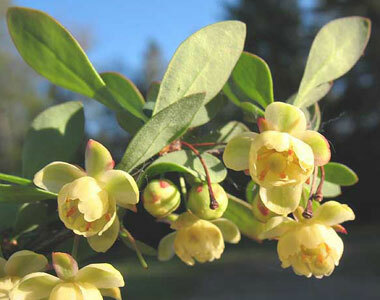 When flowers expand before the leaves. Small, more or less sharp outgrowth of the epidermis, which does not contain a vascular bundle. The first-year, non-reproductive stem produced by raspberries and blackberries (Rubus species). 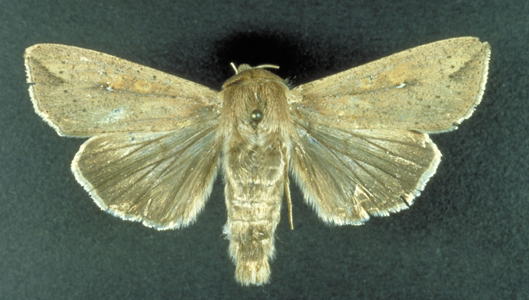 A species banned for sale or distribution due to invasiveness. A reproductive body such as a seed, bulb, or turion. A bract subtending a branching inflorescence (or a perianth in Juncus). Lying flat along the ground. Porcelain Gray, photo ©David Stephens, Bugwood.org. First stage of growth after an orchid seed germinates. Produced near the base of a structure (compare with distal). True Armyworm, photo ©John Capinera, University of Florida, Bugwood.org. A cluster of small flowers that appear to be a single flower, as in species of Benthamidia (big-bracted dogwoods) or any number of members of the Asteraceae (aster family). A thickened or bulb-like stem that functions as a storage organ. A bud at the tip of a branch that resembles a terminal bud but shows both a leaf bundle scar and a twig bundle scar near its base. Actually alternate but with nodes so crowded that the organs appear whorled. With tiny hairs barely visible to the naked eye. 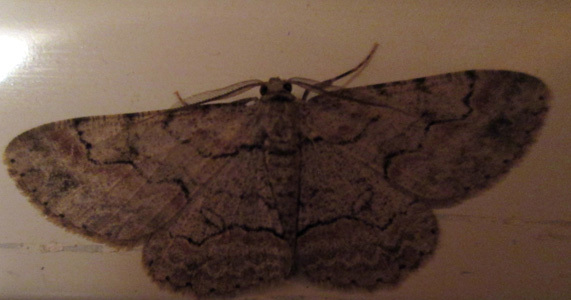 Marked with dots or translucent glands. Shaped like a pyramid (three-dimensional triangle). 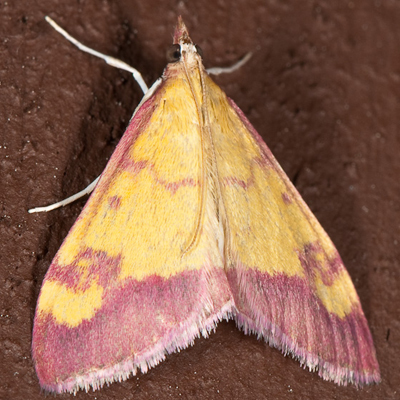 Shasta Pyrausta Moth, photo ©John Davis, North American Moth Photographers Group. Stone: the seed plus a hard layer of endocarp surrounding it. A dehiscent fruit that splits open around the middle like a box, with the top falling off and exposing the seed(s).